Britain is sending one of its most advanced warships to the Black Sea – the first time the Royal Navy has deployed there on an operational mission since the Cold War. In a dramatic show of strength by Theresa May, HMS Diamond, a Type 45 destroyer equipped with the latest anti-aircraft rockets, will set sail for Ukraine carrying up to 60 Special Boat Service and Royal Marine commandos. 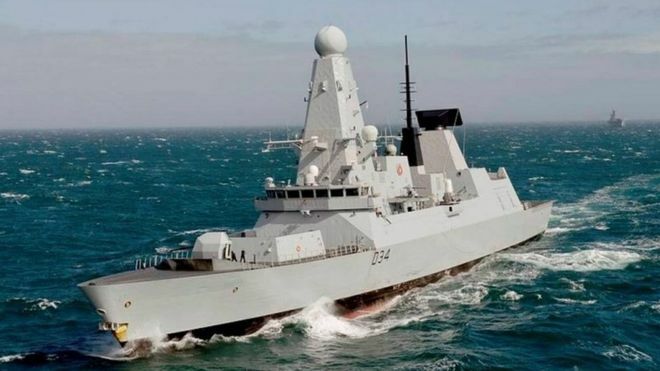 HMS Diamond will lead a Nato task force and help protect 650 British troops who are involved in secret exercises in Ukraine – a country invaded by Russian-backed rebels in 2014. UK experts are already teaching infantry skills to thousands of Ukrainian troops. The high-tech warship, which was launched in 2007 and entered service three years later, will carry Sea Viper missiles. Should HMS Diamond come under close-range attack, the ship is protected by a modern-day Gatling gun known as Phalanx – it fires 20mm shells at a rate of 3,000 rounds a minute. The ship’s amphibious warfare troops will be flown to and from HMS Diamond by Lynx Mk8 helicopter, which uses a helipad at the stern. Last night, Lord West, a former head of the Royal Navy, said: ‘We have undertaken many naval exercises in the Black Sea in the past but these were much more benign circumstances and with benign intentions. Defence Secretary Sir Michael Fallon told The Mail on Sunday last night: ‘The values of freedom and democracy cannot be traded. Britain is stepping up on the global stage and standing firm with our Ukrainian friends. HMS Diamond’s arrival in the Black Sea is expected to coincide with the deployment of British soldiers to other Eastern European states. About 800 troops will be stationed in Estonia this summer, while a further 200 are being sent to Poland. The RAF is also sending Typhoon fighter jets to Romania. The British military hardware build-up is in response to Russia massing troops and tanks in the Ukrainian peninsula of Crimea and along its borders with Baltic states. The Ukrainian government says it fears a Russian invasion could take place at ‘any minute’.